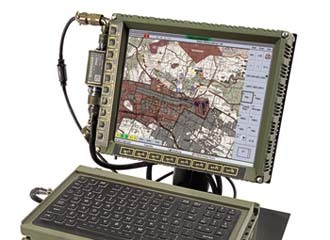 The Force XXI Battle Command Brigade and Below (FBCB2) software shown on this ruggedized JV-5 computer built by DRS will be replaced with a joint Army-Marine Corps software known as the Joint Battle Command-Platform (JBC-P). The U.S. Army and Marine Corps are developing next-generation observational software for an array of platforms, including handheld devices. In an effort to improve situational awareness down to the squad leader level, the U.S. Marines Corps and Army intend to provide the next-generation situational awareness software on ruggedized handheld platforms similar to smart phones or personal digital assistants. The Joint Battle Command-Platform is the second increment of Force XXI Battle Command Brigade and Below software that was fielded more than a decade ago. The new platform is intended to provide integrated, on-the-move, timely, relevant command and control and situational awareness information at all echelons, enabling units to become more survivable and lethal. It also will improve combat effectiveness, reduce risk of fratricide, improve latency, security and interoperability within the joint environment, and provide an integrated network with increased bandwidth and a more user-friendly interface. The purpose of the Joint Battle Command-Platform (JBC-P) is to achieve joint, platform-level interoperability for aviation, ground vehicle and dismounted soldier and Marine platforms operating on land or in littoral-dominated joint battlespace. The JBC-P lays the foundation for achieving greater digital information interoperability among joint warfighting elements. In today’s joint operating environment, the military has numerous stovepiped, service-specific command and control and situational awareness systems that are not interoperable because of the differences in data standards, protocols, security domains, procedures and network architectures implemented by each service. This major deficiency adversely affects the ability of joint warfighters to achieve information dominance, and the lack of platform-level interoperability prevents the sharing of vital friendly, enemy and other survivability information, and increases the risk of interservice fratricide. But with the JBC-P, the military hopes to enable seamless exchange of digital information across the services’ respective networks. Although the Army leads the program, the JBC-P marks a new way of doing business for the Marine Corps. It is the first program to truly be jointly developed with the Marines from the start, according to Marine Corps Systems Command (MCSC) JBC-P program officials. “For the first time, the Marine Corps is participating in development rather than purchasing a system developed by another service and attempting to make it fit. JBC-P will be the first program that is designed to fit within the Marine Corps expeditionary nature,” says Bill Johnson-Miles, MCSC. The Defense Department’s Joint Requirements Oversight Council mandated in 2004 the joint development of a common Blue Force Situational Awareness capability. The Army already had an FBCB2 that could partially fulfill the need until a fully integrated and interoperable system could be developed jointly. The Marines and coalition forces currently use the FBCB2 and are partially operating on a network provided by the Army, using Army equipment. The oversight council’s mandate combines requirements for the Army, Marines and specified Special Operations Command programs, so that all will use the same systems. It also includes requirements derived from lessons learned during combat operations in Iraq and Afghanistan. Other services have been given the opportunity to include their platform battle command requirements. JBC-P software began the engineering and manufacturing development phase in October and is scheduled to begin production and deployment by the beginning of 2014. The Army and Marine Corps currently are evaluating various handheld platforms and prototypes and expect to select a model by March 2012. The JBC-P family of platforms includes ruggedized computers, tablets, handheld devices and beacons, which are one-way position location transmitters. Current efforts to integrate the JBC-P onto handheld platforms include analyzing existing research as well as conducting Marine Corps and Army studies to identify the ideal mix of hardware, software and network. The JBC-P will use existing software code to capitalize on previous investments while the Marines and Army partner to develop new user interfaces. “We are moving forward with the understanding that the Marines and soldiers entering the services today are technologically savvy and are already accustomed to the routine use of smart phones and other small computing platforms. In mimicking the functionality, look and feel of these devices, we can realize improved speed in data dissemination, situational awareness and situational understanding, positively impacting the mission and reducing fratricide,” Johnson-Miles states. A U.S. Army soldier uses a vehicle-mounted version of the FBCB2 situational awareness software. The FBCB2 is slated to be replaced by the JBC-P, which is being developed jointly by the Marine Corps and Army. The Marines initially planned to field a handheld system known as Command and Control Compact Edition (C2CE), a Windows Mobile wireless personal digital assistant application designed to provide location and navigation information, as well as tactical situational awareness. It also was designed to allow platoon commanders and other dismounted Marines to see and edit the common tactical picture. The C2CE was developed as a branch capability from the Command and Control Personal Computer baseline and is the software load that was intended to run on the Dismounted Data Automated Communication Terminal (D-DACT). As a result of the Marine Corps’ decision to focus requirements and resources on the JBC-P program and forego further development of the D-DACT as a material solution, the C2CE software never was fielded, Marine Corps JBC-P program officials explain. JBC-P program personnel declined to comment on specific handheld devices being evaluated because of proprietary reasons, but some companies already have signaled their intent to compete in the handheld device market. Lockheed Martin announced in June that it has developed a ruggedized Tactical Digital Assistant for dismounted forces. Billed as being compatible with both FBCB2 and emerging JBC-P requirements, the device reportedly allows dismounted soldiers to communicate securely and share vital situational awareness data with mounted forces. It supports full-motion video and sensor command and control, and can host the Google Android operating system. Lockheed also announced in June that it has constructed a new JBC-P systems integration and demonstration center in Orlando, Florida, which immerses visitors in an audiovisual battlefield simulation, demonstrating the overall JBC-P command and control vision. The center uses open-architecture hardware to illustrate the sharing of situational awareness and command and control data among air and ground platforms, dismounted soldiers and tactical operations centers. While the Army and Marines work together to develop a JBC-P future, the Army also is upgrading FBCB2 software with a version known as the Joint Capabilities Release (JCR). The service received JCR from Northrop Grumman last year to begin testing. The JCR provides a common platform solution for both services and slashes the FBCB2 refresh time from minutes to seconds. It includes a commercial joint mapping tool kit, encryption for relaying classified information, and an over-the-air, self-descriptive situational awareness capability that eliminates inflexible, fixed databases—one of the biggest complaints with former versions of the FBCB2. Also in the works for the FBCB2 is an encryption tool known as the Programmable In-Line Encryption Device (PIED), which has been certified by the National Security Agency and will provide added network security. PIED software is fully interoperable with the JCR and is designed to support both current and future generations of friendly force tracking software. Northrop Grumman announced in August that it has received a potential $300 million contract to provide PIED for installation in FBCB2-Blue Force Tracking platforms and in network operations centers worldwide. DRS Tactical Systems has gotten in on the ground floor of the JBC-P by providing a range of situational awareness platforms over a number of years, and the company intends to compete for every platform, including handhelds, according to company officials. DRS has provided FBCB2 vehicle-mounted computers over the past 10 years and has delivered more than 130,000. The DRS JV-5 is the current baseline for the JBC-P and has been adopted by the Army and Marine Corps. The company also provides the Movement Tracking System and the Joint Platform Tablet.